Ubisoft has revealed the launch date of the first episode of the first Assassin’s Creed Odyssey, Legacy of the First Blade. By the looks of the launch trailer, and everything we know so far, this DLC is going to connect Odyssey with the bigger history of the Assassin’s Creed franchise. The first episode of the DLC, titled Hunted, is coming out in early December, with more following next year. Legacy of the First Blade, as I’ve said, is the first Assassin’s Creed Odyssey DLC. Ubisoft has decided to make the DLCs for Odyssey episodic, so that they can release them incrementally, and thus give players a steady drip of new content and keep them engaged consistently. One hopes that’ll be the case, at least. The first episode of Legacy of the First Blade, titled Hunted, is coming out on Tuesday next week, on December 4th. Along with the announcement of the release date, Ubisoft has released a launch trailer to whet your appetite. And what a trailer it is, indeed. It introduces us to a mysterious hooded figure, Darius, who wields the famous Hidden Blade. According to the lore, he is the assassin of king Xerxes. His mission, one assumes, is to recruit Alexios / Kassandra into the Brotherhood. 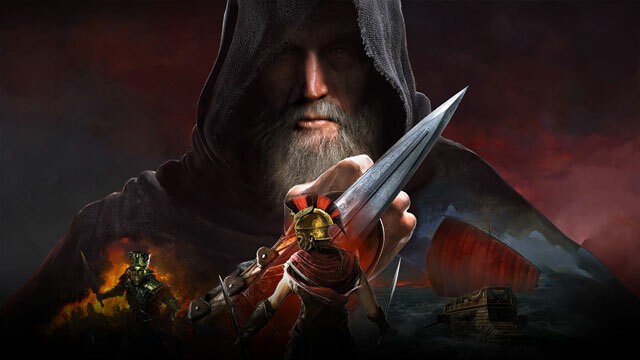 Yes, this DLC is what will tie AC Odyssey tighter with the bigger picture. There will be two more episodes of this story arc, Shadow Heritage and Bloodline. According to the announcement on Ubisoft’s website, you can look forward to them in early 2019. Later on in 2019, you can expect to see the launch of the second story arc, The Fate of Atlantis, which will also be episodic. As the name implies, this story will focus on the sunken city of myth, and your mission to save it. Both of these DLCs are a part of the Season Pass, along with Assassin’s Creed III Remastered and Assassin’s Creed Liberation Remastered (coming out in March 2019). Or, you can always purchase them separately, of course. In the meantime, check out the Legacy of the First Blade DLC launch trailer below.